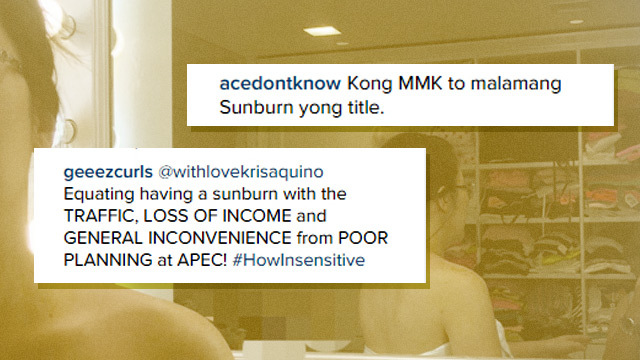 Kris Aquino has done it again. The First Sister is currently in hot water (again, for the nth time) over a recent Instagram post about being APEC-tado of sorts. We honestly don't know how to feel about this. Kris might have put a disclaimer ("a good laugh") at the beginning of the post; the only problem was, she was having a "good laugh" over the Pinoy commuter’s plight—a very delicate subject, that was all the more aggravated by the international business meet. Many weren't too amused by what they deemed an "insensitive" deed. Especially with the use of those three words. Some were simply left aghast. Others tried to look on the bright side. If someone had done this in the first place, then maybe it wouldn't have to come to this. Turning episodes of her daily drama, like this one, into primetime TV isn't far-fetched. We're talking about Kris Aquino here, after all. Time to call a behavioral expert? Still, the best comments were those that were pretty straightforward. Moral of the story? Always bring an umbrella.